When you decide to add strength training to your workout routine, knowing where to start can be tricky. And once you get going, knowing how to progress can be even trickier. After all, most weight-room newbies are unsure of their strength and, in turn, how to push it to its limits. How heavy of a dumbbell should I choose? How many sets and reps should I do? When should I move up to heavier weights? Simply put, you get stronger by stressing your muscles, giving them enough time to recover, and then stressing them again. That’s because, every time you place a demand on your body that’s heavier or harder than what it’s used to, you create microscopic tears in the worked muscle tissue. Then, those tears heal, the muscle incorporates new structural and contractile proteins, coming back just slightly stronger and better able to handle even heavier loads. Eventually, the exercise that was once incredibly challenging becomes easy and it’s time to increase the stress so that the process can happen again, and muscle growth continues. The best way to get started is to pick up a weight that you can perform three sets of 10 reps with each exercise, so you’re lifting the weight 30 times, with a couple minutes of rest time between sets. If you’re working out in your home gym and don’t have multiple weights to choose from, you can still progress in a few different ways. First, changing how you’re gripping the weight will engage different muscles. You can also change the pace in which you lift, such as slowing down the eccentric phase of the exercise (i.e. when you lower the dumbbell in a bicep curl). Lastly, you can decrease the amount of time you rest in between sets. If you want to increase your muscle strength, you’ll want to perform low repetition sets in which you’re lifting a weight that’s close to your one rep max (1RM), which is the most you can possibly lift in a given exercise with good form. For example, you might perform two to six sets of six or fewer reps, lifting a weight that is 85 percent or more of your IRM, with two to five minutes of rest between sets. If you’re able to lift seven or more reps, then you need to increase your weight. Muscular endurance is the ability of a muscle, or group of muscles, to perform continuously without fatigue. For muscular endurance, decrease your weight, up your number of reps, and reduce the amount of rest between sets. For example, perform two to six sets of six or fewer reps using 85 percent or more of your 1RM, with two to five minutes of rest between sets. To build muscle size, or hypertrophy, you’ll want to increase your number of sets, but with heavier weights and lift as many reps as you can while maintaining good form. Again, when you lose proper form, that is where you stop and make an adjustment. For example, perform three to six sets of six to 12 reps, using 67 to 85 percent of your 1RM, with 30 to 90 seconds of rest between sets. 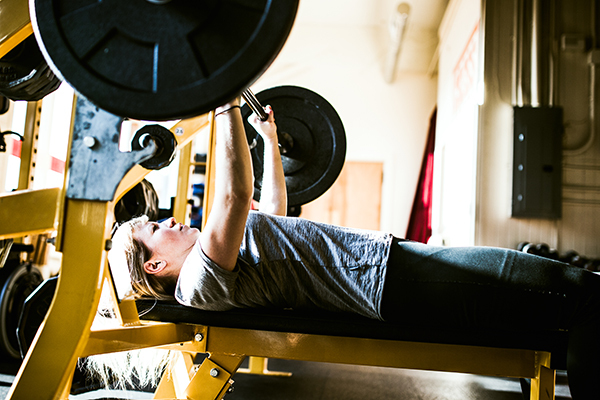 With those heavier weights, you’ll need a bit more rest in between sets. Once you hit 12 reps with good form, it’s time to pick up a heavier weight and go back to lifting 6 reps.
As you experiment with these variables (weights, sets, reps, and rest between sets), remember they are interdependent, so if you change one, you need to adjust the others. For example, if you lift a weight at the upper end of the range (85 percent of your 1RM), you’re going to perform fewer sets of fewer reps and take more rest than if you were to lift a weight at the lower end of the range (67 percent of your 1RM). So what does “easy” actually feel like? The best way to know when you’re ready to increase exercise stress — whether by lifting heavier weights, adding reps, or decreasing rest time between sets—is to track your workouts, and focus on your form. Stephen Graef, Ph.D., a sports psychologist at The Ohio State University Wexner Medical Center, suggests taking notes on your sets, reps, rest times, and how you feel for each workout. This way, you’re able to track your progress. Focusing on your form can help you know when you’re ready for more. You should always use the heaviest weight that will allow you to perform all of your reps with good form. Let’s say you lose proper form at the 8th rep of your bicep curl workout, don’t go any further and jot down a note that you lost form at the 8th rep. When it’s time to do bicep curls again, see if you can perform more than 8 reps with good form. Once you’re able to accomplish all 10 reps with perfect form, and your last few reps of an exercise feel similar to your first few, it’s time to pick up a heavier weight. Joel Freeman, C.P.T., co-creator of Beachbody’s CORE DE FORCE says, “No matter your strength-training experience or what workout you’re doing, improving your form is a huge marker of progress.” When learning new moves, Freeman recommends looking at yourself in a mirror, or even filming yourself working out, so you can go back to analyze and improve your form. P90X trainer Tony Horton recommends lifting the heaviest you can for six to 10 reps, and when you can do 12 reps at that weight, move to the next heavier weight and go back to six reps.
With all this pushing, it’s important to remember that it’s during the recovery process that your muscle tissues actually become stronger, bigger, and fitter. And there’s a fine line between pushing hard and getting the results you want versus pushing so hard that you actually hamper muscle growth. Again, this is where tracking your workouts comes in handy. If you lift significantly less weight for two weeks in a row, then you might be pushing too hard and not building muscle properly. A great way to get into weight lifting is to sign up for Beachbody On Demand and check out programs that incorporate strength training, such as A WEEK OF HARD LABOR, Body Beast, SHIFT SHOP, P90X, The Master’s Hammer and Chisel, and 21 Day Fix. Thank you K. Aleisha Fetters, C.S.C.S. Nothing derails your fitness goals like feeling sore. Yet getting sore is almost unavoidable—it’s a rite of passage, if you will. But it doesn’t have to wipe you out. Follow these tips and, if you’re lucky, you’ll avoid the dreaded DOMS (delayed onset muscle soreness) monster altogether. If you’ve been exercising, but it’s been more than a week since you last worked out, follow the same pattern but go harder, based—again—on how fit you are. A good example to use here would be to start with about half of the workout scheduled—something like the warm-up, cooldown, and one round of exercises. Because you have a better fitness base, you can advance a little bit further each day than if you were out of shape. In general, take about a week to get back to full-bore 100% effort. This is also the example you want to use if you’ve been training and taken some time off. If you’ve been exercising, but are starting a new program, base how hard you push yourself on how much advancement there is in your program. For example, if you’ve been doing INSANITY and you’re moving into INSANITY: THE ASYLUM or P90X, you can probably give it 100%—though you might not want to lift too much weight. But if you’re coming into one of those from FOCUS T25, you’ll want to back off a bit from what you could achieve on those first few days. Whenever your program makes a big jump, in time, intensity, or style of training (from all cardio to weight training, for instance), you’ll always want to hold a bit back in the beginning. In other cases, avoiding eccentric motion can be impossible. Jumping, for instance, uses concentric force to get you elevated, at which point you need to land, which is eccentric. The only way to do concentric-only jumps is to jump onto a platform and then lightly step down. Again, not too practical. You can, however, limit the amount of time you’re lengthening your muscles. Slowing down your concentric motions and returning to the start position very quickly, or eliminating the airborne portion of jump training, are good ways to mostly avoid eccentric motion with only slight modifications. You may have noticed that a lot of very popular exercise programs actually target jumping and eccentric movements. That’s because training them is highly effective, just not until your body is in shape to handle it. Which it never will be unless you proceed slowly and carefully. Dehydration can also make you sore. In fact, once you’re used to your workout program, nearly all excessive soreness is due to dehydration or nutritional deficiencies. Most people are chronically dehydrated. In fact, you can actually get sore by simply being dehydrated, even without the exercise. Adding exercise increases your water needs. A lot. Hydration is your body’s first defense against, not only soreness, but also most illnesses and other maladies. How much water you need varies depending on your activity level, lifestyle, where you live, etc., but an easy gauge to use is to drink half your body weight in ounces each day. That’s before you account for exercise. For each hour you work out, you should add another 32 ounces (on average). This, too, varies based on the individual, heat, humidity, exercise intensity, and so forth, but you probably get the idea. You need a lot of water for optimal performance. It’s also possible to drink too much water, a condition called hyponatremia. While this is a deadly condition, it’s irrelevant for most of the population for most conditions. Hyponatremia is an imbalance of water and electrolytes. However, it’s very hard for normal humans to get hyponatremia in everyday circumstances because you have to drink a lot of water, have very little salt, and sweat profusely for a long time. So while it’s a very real danger for those doing Ironman triathlons or people stranded in deserts, it’s not a relevant concern for most of us. If you’ve been eating regularly, your foods contain some salt (most do), and you’re not exercising over an hour or two per day, it’s not something to worry about unless you’re drinking multiple gallons of water a day. The hour after you finish exercising is your nutrition sweet spot. The quicker your muscles recover, the less sore you get, so you never want to skip your postworkout snack unless you’ve reached a point when you know you’re not going to get sore. What this snack should consist of has been debated for ages but countless modern studies show that glycogen depletion (replenished quickest with simple carbohydrates), should be your primary concern. Glycogen is a fuel that your muscles store in limited amounts. When you run out of it during exercise, your workout goes south very quickly. When it’s gone, muscle damage increases until it’s been restored. Left out of this puzzle is fat, but not in all forms. Some studies show promise using medium chain triglycerides (MCTs) postexercise, though it’s probably too techie to bother with in this article because most consumable fat slows digestion of all nutrients, which should also be your first priority when excessive muscle tissue damage has been done. What is debated, however, is what that ideal carb to protein ratio should be. It basically comes down to how depleted your glycogen stores are. The more depleted, the more important carbohydrates become in your replenishment strategy. While you will learn to tell when your glycogen is gone (or low) through experience, keep this in mind for now: the body can store enough glycogen for about an hour of hard training. If your workouts are 30 minutes or less, you may not need any carbohydrates. Approach an hour and you probably need at least some. It also matters what you’ve eaten during the day, prior to the workout. If you’re hungry at the start, it could be an indication that your glycogen is low. If you start low, you may run out quickly. Glycogen depletion is characterized by feeling empty. If you hit a point in your workout where you feel like you can’t go on, or you’re performing worse than you had been, you’re likely out of glycogen. Known as bonking in sports circles, when this happens you’ll want to shut down a workout and fuel up ASAP. When you’re out of glycogen, it’s most effectively replaced by a targeted recovery supplement, like Results and Recovery Formula. These are formulated using every nutrient your body can use for recovery. In lieu of that, almost anything carb heavy can be effective. Something like a small bowl of cereal, perhaps with a banana, is a decent substitute. Aim to consume between 100 and 250 calories, depending on your size and how difficult your workout was. More than that probably can’t be digested within an hour. If your workout was short or didn’t seem to tax you too much, opting for a protein-based snack is a better choice. Whey protein, due to the quickness your body absorbs it, is the best option here, and it’s also where you might consider MCTs if you’re intrigued by them. It’s worth noting that the more you stretch yourself with your choice of workout, program, or even each individual workout, the more you increase your chances of getting sore. The right program—or a trainer/coach—should ease you into exercise at a pace your body can handle, which is always the better choice. But, you know, whatever works for your psyche is probably what you’re going to choose. And that’s okay. Just be honest with yourself, and follow the rules above if you know you’re biting off a little more than you can chew. No matter how diligent we are, we all seem to mess this up, somehow, sometimes. Depending upon how much you skewed it, you can be back at full strength within a few days. Occasionally—at least if you’re like me—you’ll go way beyond what you should have done. In such cases, you can be out up to a couple of weeks. Either way, these tips will help you get back on the fast track. If you really overcooked it, and things like walking down stairs feel like a torture test (I’ve been there), you won’t want to do much beyond moving as much as you can. All movement promotes blood circulation, and the more blood you circulate around your body, the quicker you’ll heal. If you have a more sensible soreness, you can do your workout at a modified pace or, better yet, choose a recovery workout. If you’re using a Beachbody program, it probably came with a recovery workout or two. These workouts are designed to help your body work out kinks and soreness better than doing nothing could ever hope to. They can be used anytime you need them, can’t be done too often, and always leave you feeling much better than before you started. You can also induce circulation with some other techniques, all of which will help. In extreme cases, physical therapists are loaded with various devices to aid recovery, but here are three you can do at home. While none of these will rid you of soreness alone, each one you can put into practice improves your chances of relief. Restoration poses – Also known as taking a load off, yoga restoration poses are a bit more targeted than just kicking it on the couch with your feet up, though some of the poses are very similar. These are movement-free poses designed to circulate blood in and out of targeted areas. In the “what doesn’t work” section, see vitamin I (street name for ibuprofen, naproxen, and aspirin). While they are a common tool for recovery and pain relief, especially for recreational athletes, studies have repeatedly shown that they don’t aid in muscle recovery and, in fact, may exacerbate muscle breakdown. Plus, they come with a slew of other side effects. Therefore, they should be avoided as much as possible. Understandably, you may want to use them to mask the pain in the most acute stages. Just know that it’s masking, and not solving, the recovery process. There’s too much on this topic to go into here, so I’ve provided some studies (below) for the curious. Donnelly AE, Maughan RJ, Whiting PH. Effects of ibuprofen on exercise-induced muscle soreness and indices of muscle damage. Gorsline RT1, Kaeding CC. The use of NSAIDs and nutritional supplements in athletes with osteoarthritis: prevalence, benefits, and consequences.Clin Sports Med. 2005 Jan;24(1):71-82. Rahnama N, Rahmani-Nia F, Ebrahim K. The isolated and combined effects of selected physical activity and ibuprofen on delayed-onset muscle soreness. Journal of Sports Science. 2005 Aug; 23(8): 843-50. Trelle S1, Reichenbach S, Wandel S, Hildebrand P, Tschannen B, Villiger PM, Egger M, Jüni P. Cardiovascular safety of non-steroidal anti-inflammatory drugs: network meta-analysis.BMJ. 2011 Jan 11;342:c7086. doi: 10.1136/bmj.c7086. Warden SJ. Prophylactic use of NSAIDs by athletes: a risk/benefit assessment. Phys Sportsmed. 2010 Apr;38(1):132-8. doi: 10.3810/psm.2010.04.1770.